Born in 1935 Pierre Mayer has already had a life which has taken him into many different directions. He started performing magic tricks at the age of 5, influenced by his father’s magic store and the conjuring virus has never left him. Pierre’s art education and inclination for oil painting led him to the Louvres Museum in Paris where he painted reproductions of masters in his early years. 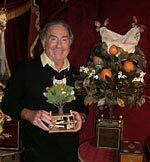 Pierre subsequently owned a chain of 5 electronic stores in Paris, and his varied hobbies included collecting mechanical music, vintage toy and automata. On early visits to Cabaret Mechanical Theatre in London he admired the work of Paul Spooner, however it is only in the last two years that he has decided to make pieces of his own, and Pierre wanted a different concept for his pieces, than those he had seen at CMT, and so he focused on his experience and creativity with magic and conjuring when designing his pieces. 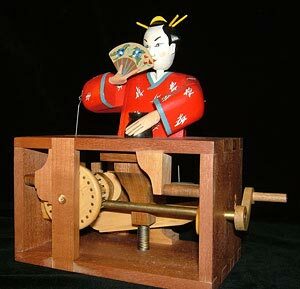 Pierre created wooden Magic Automata that perform tricks when the handles are turned and sometimes even fool magicians. 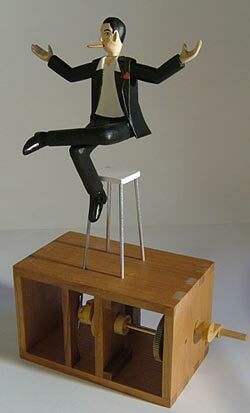 Fechner’s Levitation is based on the Pierre’s friend Christian Fechner the magician who performs with a trade mark cigar.